In Ecuador, bottles as containers for liquids appeared in the Late Formative period at the end of the Machalilla culture (1600 BC to 800 BC). Whistle bottles were created and perfected during the Chorrera culture (900 BC to 100 BC), and finally evolved into polyphonic bottles during the Bahía culture (500 BC to 650 AD). During the Chorrera phase, moulded aesthetic elements were developed and incorporated:, such as zoomorphs and anthropomorphs, phytomorphs, architectural forms, whose animated references were related to the acoustics they produced, giving 'onomatopoeic' sounds of nature (e.g. birds, monkeys, frogs). 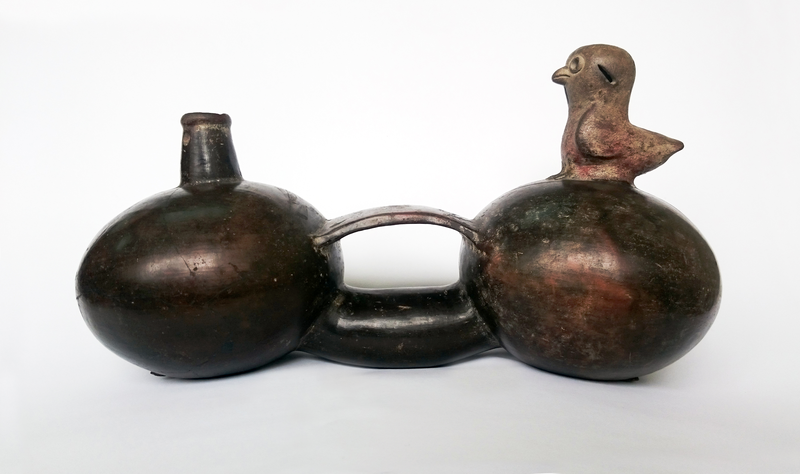 The current research focused on the structural and systematic study of a double ellipsoid ornithomorph bottle with a whistle from the Chorrera-Bahía culture (900 BC to 100 BC), an object that is currently in the National Archaeological Reserve of the Ministry of Culture in the city of Quito, Republic of Ecuador (Ch-B-1-38-69) (Figure 1). Two replicas and the original were investigated in situ by the Universidad Central del Ecuador and it was possible to determine that both blowing into and moving the objects when filled with water produced the sound. We interpret this as a need to 'automate' the sound production, and the acoustics derived from the movement of water is what possibly motivated Crespo (1966) to call them 'magical objects'. This research was carried out in the laboratories of the Faculty of Arts of the Central University of Ecuador. The publication was financed with the researchers' own resources supplemented by the Open Access Archaeology Fund. To both institutions we offer our thanks.